Dog booties. We have tried a lot of different types and a lot of different brands. The ones that stay on the best are ones we bought were flourescent orange hunting ones we bought at Cabelas. (We used them not just for hiking in the snow but for also covering injured paws that we didn’t want the dog to chew on. That worked until Chase chewed through one …) Some booties are just for warmth and some also have traction. The higher up on the leg they come, the more likely they will stay on. Medical tape. This is my favorite. I just wrap medical tape around their paws. This works really well when it’s not too cold but you have a dog with long hair that is always catching snow and forming icicles between her toes. 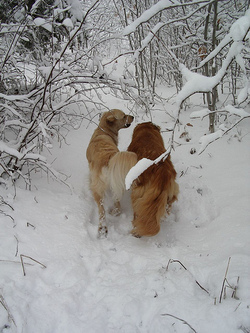 Vaseline can help sooth paws already irritated by the snow and it can also help prevent snow build up if you put it on before you go out. Any other tips to share with us?